Crane Falls is a 10-15 foot falls off Cheohee Road below the Forest Service's Cherry Hill Campground. 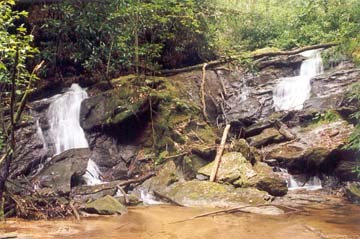 At the top of the falls, Crane Creek is split with half of the stream cascading straight ahead while half sluices down the side. The halves rejoins in the sandy and limb-filled pool at the base of the falls. The .3 mile trail begins at the bridge over Crane Creek (the first bridge you come to on the road). Follow a old road past ATV-barricading rocks and past a some primitive campsites. Rock hop across Crane Creek and follow the path upstream. A number of downed trees obscure the trail and make for slow going. Directions: From Walhalla, follow SC 28 north to SC 107. Turn right onto SC 107 and follow for 6.3 miles to Cheohee Road (FS 710). Turn right and descend down the road 3.2 miles to the bridge. Look for Wash Branch Falls after .4 mile on the road. This 20-foot cascade is roadside but has little streamflow and is obscured by rhododendron.